We know that Pinterest is an incredible tool for marketing. It is widely known as a photo sharing or hosting social network where we can store, share blog images as well as private photos on the server. The social site can also send massive traffic to your blog posts via images attached to them. As I said earlier, time is very important for social media campaigns. You should promote the contents at the peak time to derive maximum benefits. But it is not possible for us to wait for the best time and start shares. The automation tools are the only solutions in this case. A wide range of social media marketing tools is available on the web to make your promotions easier. While analyzing them in detail, you will come to know that only a few of them provide Pinterest schedule feature. Buffer and SocialPilot are popular apps for Pinterest marketing. They let you schedule and create pins anywhere anytime even on a smartphone or tablet. Today we’ll tell you how to schedule Pinterest pins using Buffer and SocialPilot. Buffer is a simple, elegant app for automizing your social media promotions. It works with Facebook profiles/page/groups, Twitter, LinkedIn profiles/pages, Google+ profiles/pages, Pinterest, and others. Connect your photo-sharing site’s account to schedule Pinterest pins. Once connected, it will appear on the left pane of your Buffer dashboard. Choose your Pinterest account from the left side, visit Content tab and place cursor inside the message box. It will ask you to choose a Pinterest board for pinning the post. Do that. Enter your text along with photo, video or link. If it is a link post, Buffer will display thumbnails of all images on the page. Choose an image to activate the blue color button. You can either schedule the pin or send it to the queue which will be automatically sent by Buffer at the best time of posting. SocialPilot is another popular app to schedule Pinterest pins. It is easy to use, highly customizable and comes with a beautiful interface to work. Other than regular promotional channels, it allows you to schedule contents on Facebook groups, Pinterest, Tumblr as well. 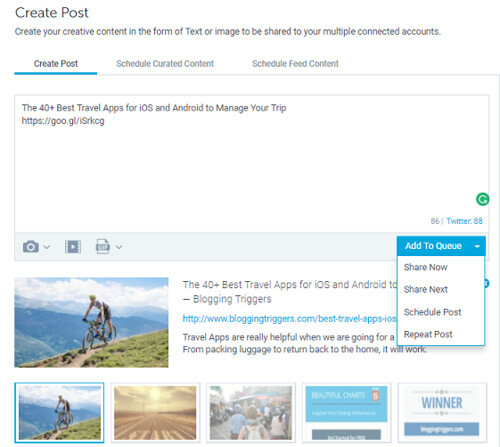 After Pinterest integration, visit Posts> Create Post to schedule Pinterest pins. Enter the title and link. Select your Pinterest board from the right pane. 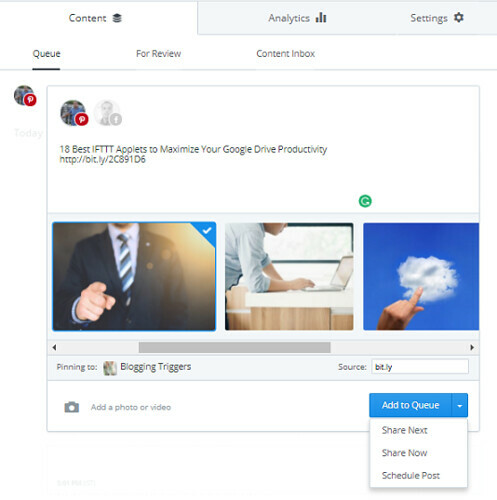 By default, SocialPilot will choose the featured image of your post for pinning. You can replace it with other post images or upload an own photo, video, Gif file if needed. When you finished, send the post to your Pinterest queue or schedule it for later. Are you using any other app to schedule Pinterest pins? Let us know through comments.